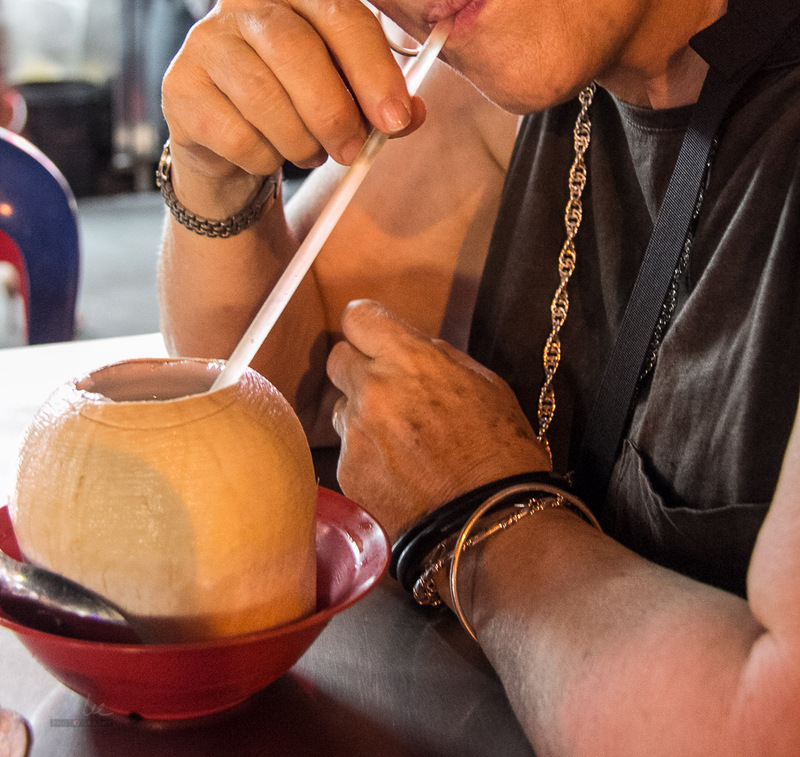 Sightseeing is hot work in the tropics and you need to cool off regularly. The locals have come up with many ways of doing this and the options are usually pretty sweet! If you don’t have a very sweet tooth and are having a drink in a coffee shop (kopi tiam) or buying a packet drink – ask for ‘kurang manis’ (less sweet). Cendol is a dish served across South East Asia in slightly different variations. 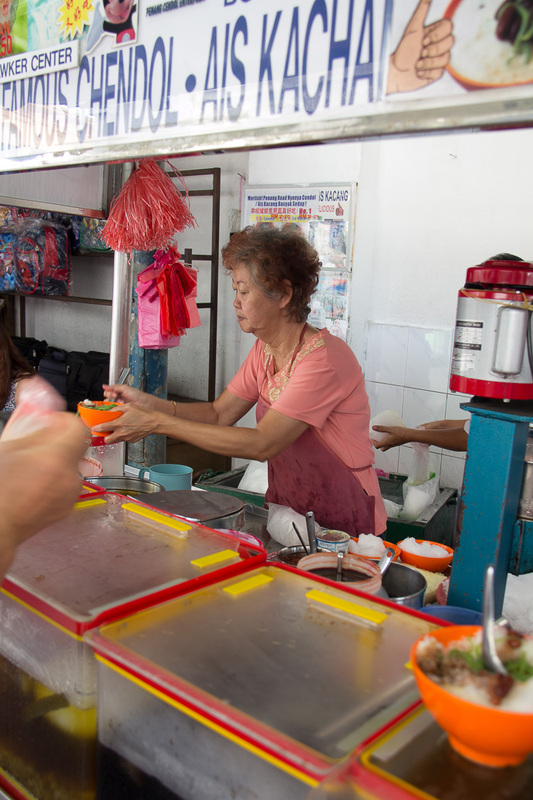 The ‘green worms’ are made by pressing warm green dough made with rice or sago flour through a sieve into cold water. The green colouring comes from juice squeezed from the fragrant leaves of the pandan or screw pine plant. 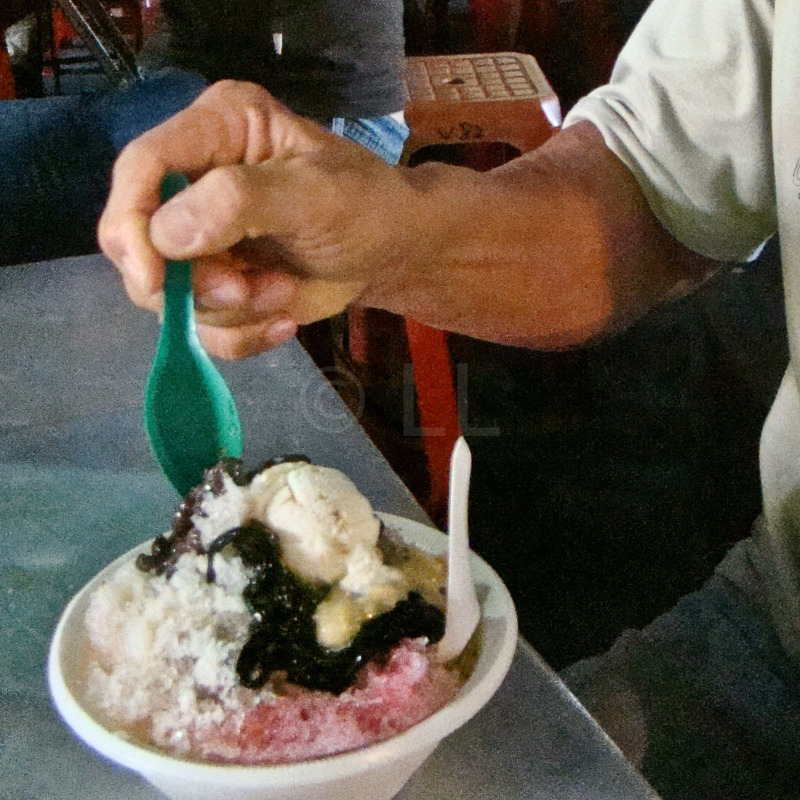 The cendol ‘worms’ are served in a bowl of shaved ice with palm sugar (gula melaka) and santan (coconut milk). You can have red beans added in as well, if you like them. 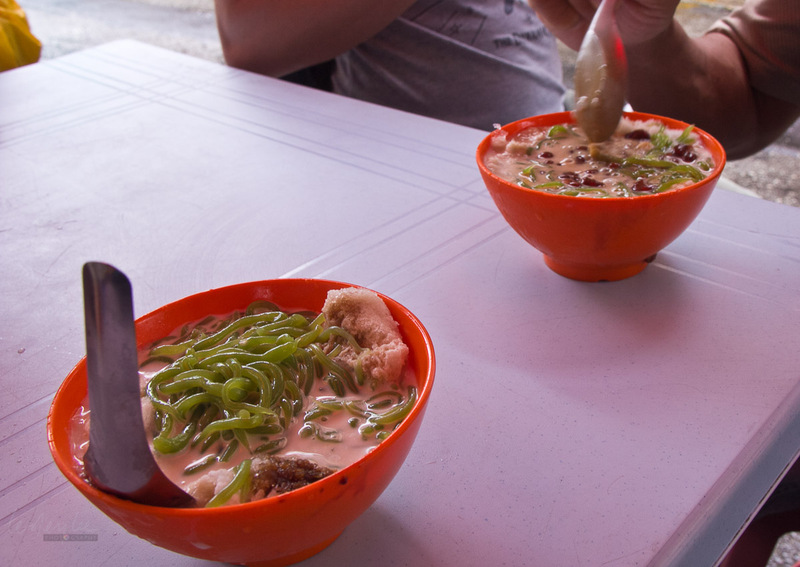 The best cendol is usually found where the queues are long! Our favourite is in Lebuh Keng Kwee, off Penang Road. The stall on the left as you walk in from the main road is, in our opinion, the tastier of the two on offer. They are closed on Tuesday. The one opposite is also ‘famous’, but we think not quite ‘there’ though obviously the long lines say others disagree. Cost – less than RM3 per bowl. 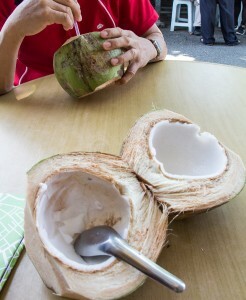 Coconut water from young fragrant coconuts is one of the best thirst quenchers. It’s also an excellent way of replacing lost electrolytes, so there’s nothing to feel guilty about here! 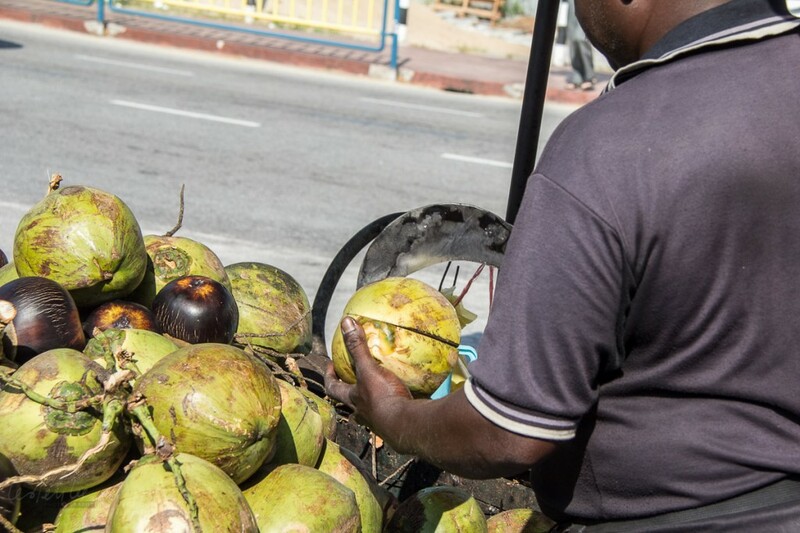 There is a stall selling un-chilled coconuts (just as good) just at the entrance of Chew Jetty in Pengkalan Weld. They cut them open for you and after you’ve finished you can use the supplied spoon to scrape out the meat. If you prefer your coconut chilled, look for a place which has the green outer covering removed. That’s just so they can fit them in the fridge easily and they will open them for you when you order. Gurney Drive eating stalls is a good place to find these. Cost – RM4.50 – RM5. Look for a stall that has plenty of canes and a crusher (mangle). The best juice is crushed and drunk immediately. Fresh squeezed sugar cane juice is not ‘sugary’, but has a refreshing sweetness that is nothing like white sugar stirred into water. You can add ice if you wish, but when it’s freshly squeezed, somehow it doesn’t really need it. 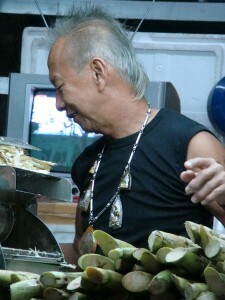 Look for this interesting sugar cane seller at Gurney drive night stalls, he also sells ambla juice with salty plum, also very refreshing, or if you’re going to Kek Lok Si Temple in Ayer Itam, there is a good stall at the corner near the parking lot at the foot of the hill. Cost depending on location, RM1.50 – RM2. Local coffee is roasted with either butter or margarine and caramelised sugar, which gives a special flavour to the beans which are then course ground. The best coffee makers have their followings and some are found in only one coffee shop, others sell their ground beans to many. What the kopitiam (coffee shop) does with the beans can make or break the brew. A good cup of local coffee is brewed with the hot water poured over it in a metal mug and filtered through a cloth into a second mug. From there it is decanted into the cups/glasses and sugar, condensed milk and /or ice is added. Kopi ‘O’ is hot black kopi (coffee) Kopi is with milk. If you want ice, you just add ‘ice’ or ‘peng’ at the end – ‘kopi peng’ = ‘iced milk coffee’. Make sure you tell them you want it ‘kurang manis’ if you want it less sweet. We’ve recently rediscovered the Kek Seng Kopitiam in Penang Road, which has been in business for over a hundred years. Their kopi is one of the best, smooth and not at all bitter or sharp. Cost varies depending whether it’s black, white, hot or cold, but one cup/glass should be less than RM2. Ice cream potong is an inexpensive ice block treat available from small shops all over Malaysia. Popular flavours are red bean, corn and yam. Also becoming popular are flavours like durian and chempedak, a stronger flavoured version of the popular jackfruit (nangka). 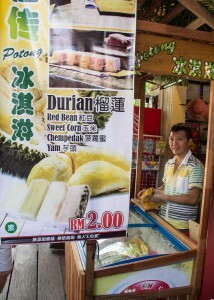 We found these slightly more expensive ones along the Chew jetty and enjoyed our corn and durian ices. A small block is RM2 and a larger one is RM3. The stick is fairly thin, so it is a good idea to open the wrapper from the top and keep it as a cone to stop the drips and potential ‘drops’. A regular ice cream potong, smaller than these will generally cost between RM1 and RM1.50. Ice kacang (also known as ABC because it’s got a mix of all sorts of things) is really what you want it to be. It starts with a bowl of shredded ice, on top of red beans and coloured jelly pieces. Or you may have them on top with the ice below if you prefer. Add some skinned groundnuts, maybe some cendol and some people even ask for slices of bananas and I’ve even seen raisins! A spoonful of creamed sweet corn finds a comfortable place and adds some extra colour and then a quick swirl of red, green and gula melaka syrups completes the pile. Oh yes! Some places give you an extra option – a scoop of ice cream on top! This would be ‘Ice Kacang Istemewa’ – Special. 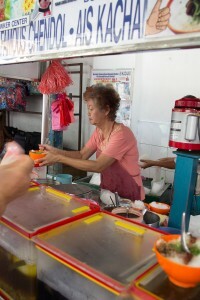 Cost – depending on the ingredients and how ‘famous’ the stall is, up to RM5. In days long gone, kids used to be able to get the ice made into a ball around the ‘bits’ with the syrup poured over the top. Not easy to find now as it’s obviously a VERY messy treat, but you may be able to persuade the stall holder to make you your own special ‘ice ball’. 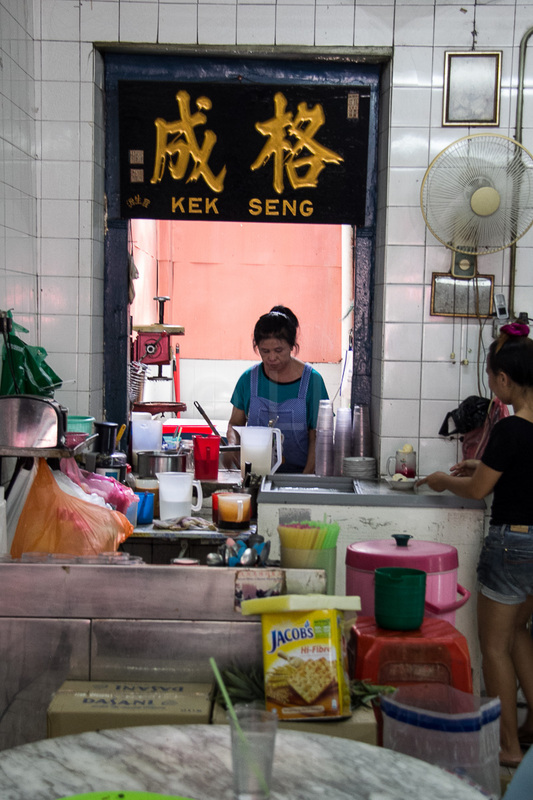 There are a few places around, selling their own home made ice cream, but one of the most popular has to be Kek Serng kopitiam (of coffee fame above). 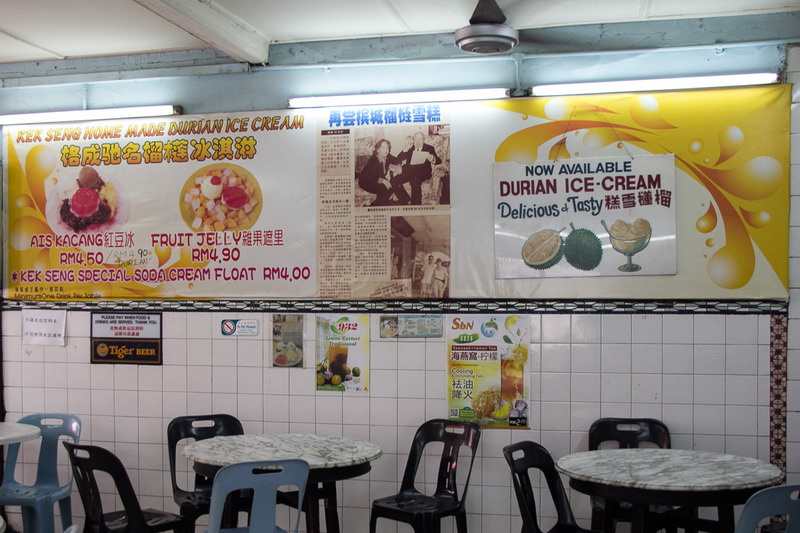 We were so keen to test the reputation of this treat, that the photographic evidence is rather flawed, but trust us, the scoop of durian ice cream and its companion of corn ice cream, were most satisfactory. The jelly was a bit unnecessary we felt, though it tasted fine and didn’t distract from the true taste test. 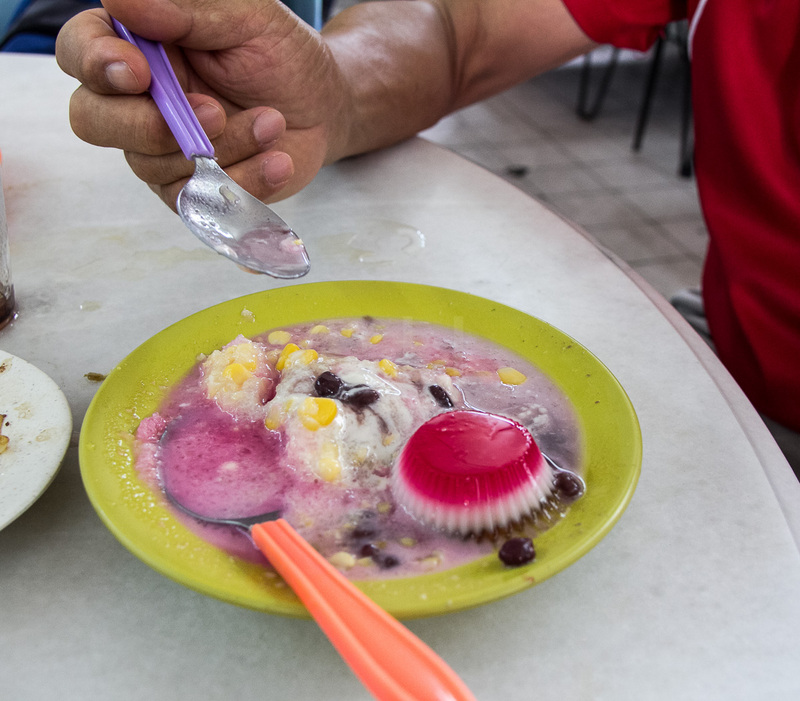 The ice cream sat on a base of ice kacang, with just the basic ingredients – shaved ice, beans, jelly, sweet corn and syrup allowing us to fully enjoy the ice cream. 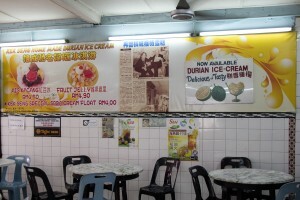 Cost with two scoops (including durian) ice cream – RM4.90. If, after all the choices we’ve put forward, you’re still really missing your familiar artisan coffee, don’t worry. You will find many places to get your fix as you wander around the heritage enclave, but do try the local offerings as well. 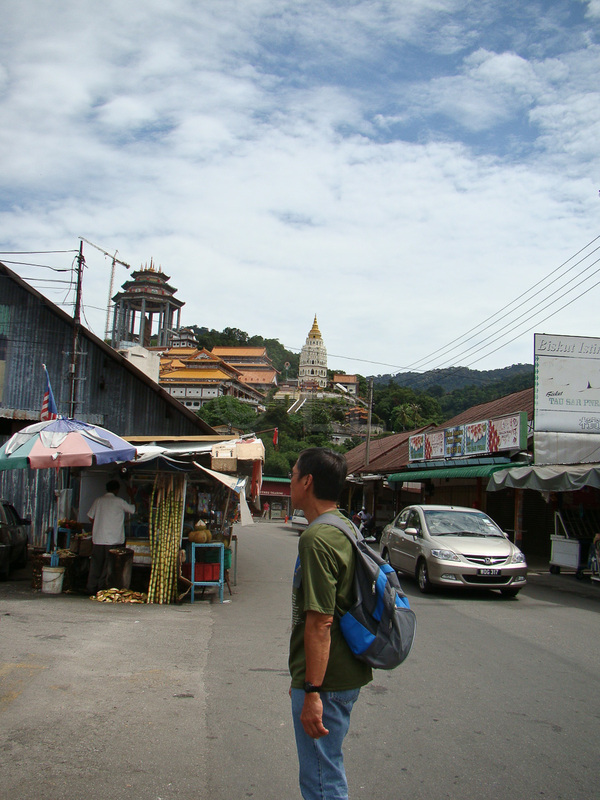 And next time round we’ll check out some of the best teh tarek (pulled tea) cuppas in town.